Moringa oleifera Lam. is a medium-sized tree with a straight trunk with bark that is whitish grey. It has a tuberous taproot that can tolerate drought conditions. This umbrella shaped tree has a loose crown of feathery foliage. The foliage is evergreen or deciduous depending on environmental conditions. In season the trees are covered in creamy white flowers arranged in drooping panicles. 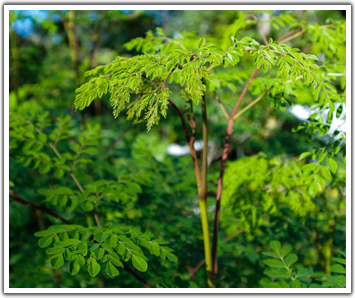 The Moringa tree has many potential uses, and as a result a great deal of research and development has been done. Moringa is regarded as the "poor-person's plant" with the promise to benefit rural Africa. Moringa shows the capacity to provide many different foods and other profitable uses with minimum growing and harvesting input. Moringa leaves are an inexpensive source of proteins, vitamins and minerals. Seeds of Moringa oleifera yield 25 - 30% non-drying oil, known as Ben oil, used for lighting and lubrication of watches and other delicate machinery. The oil is clear, sweet, odourless and turns rancid slowly. This oil resembles olive oil and may be of value as a constituent of non-yellowing, non-drying plasticising alkyds and is highly valued by perfumers. In Africa a multi-purpose crop, such as Moringa will benefit rural communities in the sense that large scale plantations will provide substantive real employment opportunities and sustainable income for marginalised communities. Moringa is a suitable candidate for commercial establishment in different areas in Africa, as it, despite mostly naturally occurring in the tropics and sub-tropics, can tolerate higher temperature extremes and/or survive light frost and tolerates a wide range of soil and rainfall conditions. The development of Moringa plantations to improve socio-economic conditions of rural communities are supported by various NGO's, Trees for life, Church World Service and Hunger organisations. At "The Moringa Tree" the vision of the team is to develop sustainable production systems for Moringa, that can be implemented in Africa for long term financial gain, job creation and poverty alleviation in rural areas. The team favours an integrated farming system with the production of both primary and secondary moringa products and by thus reducing risk to the minimum and optimizing the potential for long term success of moringa projects.